GuvMTz "FORT" pistol series. GuvMTz is the Defence Procurement and Manufacturing Service of the government of Ukraine. They rely on a state-owned company, FORT, which is actually the ONLY authorized firearms manufacturer in Ukraine, exception made for the special application weapons made by the plants of SSTC-ARA (Ukrainan State Scientific and Technology Center for Artillery, Rifles and small Arms). The FORT pistol series represents an upgrade of the FORT-12 pistol already displayed on the website at: http://www.securityarms.com/20010315/galleryfiles/1400/1486.htm As you will see by THAT picture, the FORT-12 is just like a compact version of the czechoslovakian CZ MODEL 1975 pistol, and in fact the FORT pistol series in manufactured with machineries buyed from the Czechs. The version of the FORT-12 you'll see in THAT picture is now still manufactured as the FORT-12H, and it is an élite pistol; the FORT-12 was BY ITSELF initially designed to arm only senior high-rank military, police and government officials, and that "Deluxe" version is the evidence of this past tendence. GuvMTz has however launched a massive campaign to replace all the old MAKAROV pistols still in ukrainan service, but the result has not been as hoped: even if the measures of the gun are still compact, and this to fit the habitudes of the military and police officers which used to bear MAKAROVs, the gun is BULKY due to its grip, out of proportion respect to the resr of the guns since it fits an high-capacity 13-rounds magazine of .9x18mm - Makarov High Impulse bullets. This carachteristic makes it uncomfortable to fire to those who don't have hands big enough, and also prevents the gun to be sold abroad, since today's military and Law Enforcement marketplace is no longer interested in the weak .9x18mm ammunitions. The FORT-12 has however been upgraded in a STANDARD SERVICE PISTOL version for the internal ukrainan military and law enforcement, this version is exactly as the original FORT-12 "deluxe" pistol but not as much complicated as its predecessor in its external look. The FORT-12L has been instead specifically designed for élite police forces. It's a bi-tone gun, slightly modified in its external shape so to be more comfortable to use and "readily operable", with an integrated laser beam sight. The FORT-12R has been intended for export. It's essentially a FORT-12 chambered for the .9x19mm-Parabellum round, also with an high-capacity 15-rounds magazines. It doesn' makes it more comfortable to shoot but it hopefully will make of it a more acceptable gun at least for "western" oddities collectors. 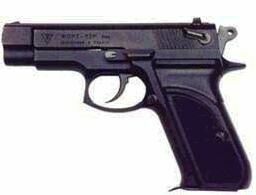 The FORT-14 has been designed as an ARMY pistol. It is a full-sized gun much more similar to the BROWNING HIGH-POWER than to the rest of the FORT series. It's available im both .9x18mm-Makarov and 9x19mm-Parabellum, and it features a rail under its frame to fit tactical laser modules and illuminators for Counter-Terrorism purposes, as seen in the picture. It has been intended also for the internal ukrainan Special Forces, which even in the Warsaw Pact era were used to handle much bigger guns that the tiny police MAKAROVs, such as selective-fire STETCKINs. The FORT-5 is the "best child" of the series. Externally made of polymer, it heavily borrows from pistols like GLOCKs, KAHRs, HS2000s. It has an internal hammer and its compact dimensions and its QUADRUPLE ammunition availability (.32-ACP, .380-ACP, .9x18mm-Makarov, .9x19mm-Parabellum), all with medium-capacity magazines, make of it the best pistol of the FORT series: concealable easy to use, comfortable to fire. The ENTIRE FORT Pistol Series has been presented at the last IDEX defence expo, which took place in Abu Dhabi (United Arab Emirates), just two or three days before the brokeout of the "Operation Iraqi Freedom". Those guns are ALL been noted as "readily available for export" and "readily available for internal ukrainan service", although it is unclear IF and WHEN those guns will be REALLY fully-scale adopted in ukrainan internal service; some Middle-East countries representatives presents at the time at the expo shown interest for those products, but it is also unclear if sales were made and if THERE WILL BE any sale of those pistols, that, exception made for the compact FORT-5 which follows the current trend in firearms and so is the most probably commercially viable product in the entire cache, are actually uncomfortable and out-to-dated (mostly due to the weak caliber them fire) oddities.